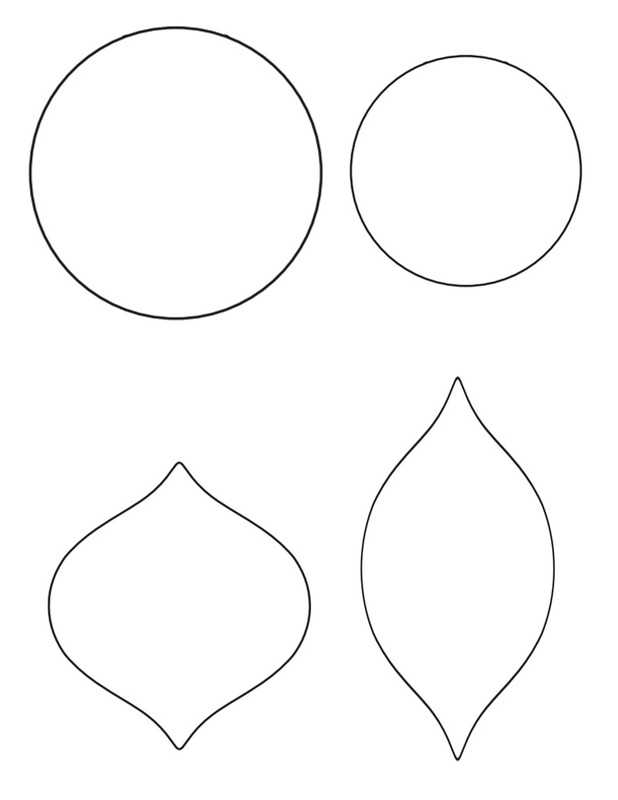 I should also add that I’m too much of a perfectionist to freehand ornaments, bows, and ornament designs with scissors so I created patterns, which I’m sharing with you at the end of the post. In case you didn’t know, felt sticks to felt so the ornaments and presents can be placed and removed anywhere on the tree. scissors … these are my favorite! I printed the patterns onto card stock, cut them out, traced them onto pieces of felt, and then cut them out. I should add that I traced the patterns onto the shinier, smoother side of the felt, leaving the fuzzier side facing out because I think the shinier side sticks to the fuzzier side better. 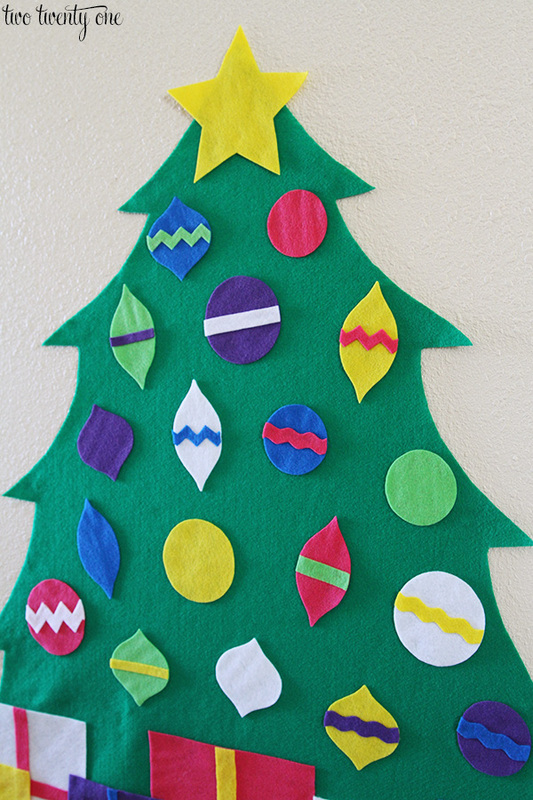 To make the tree, I folded the green felt in half with the shinier side on the outside and freehanded half of the tree with a piece of yellow chalk. Then, with it still folded, I cut it out so it would be symmetrical. After cutting out the tree, I decided it was too tall so I cut off the bottom portion. But feel free to make the tree as tall or short as you’d like. I initially mounted the tree to the wall with painters tape, but that didn’t hold so I went to masking tape, which has worked the best. I wanted the ornaments to look similar to the glass ornaments I’ve been using for years so I went with blue, purple, green, yellow, hot pink, and I added some white to break things up a bit. After I cut out all the ornaments, I created different designs to glue on top of the ornaments to jazz them up a bit. 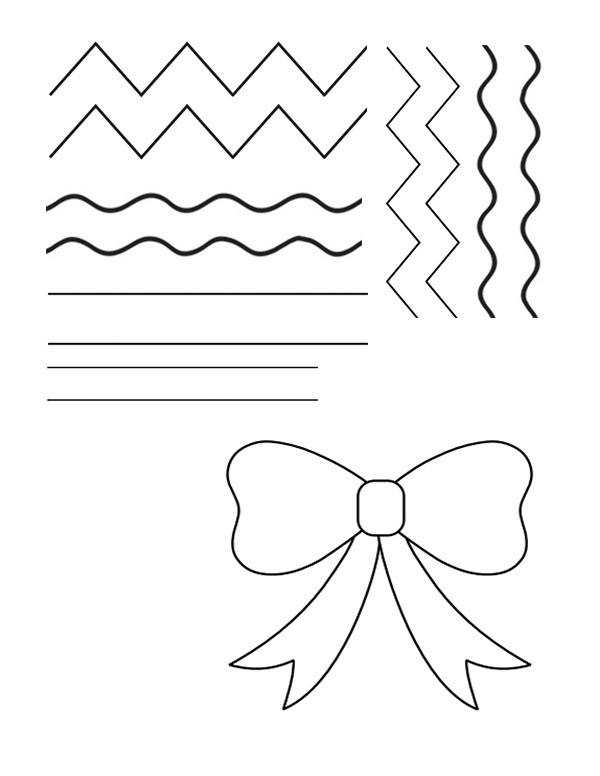 I didn’t use a template for the presents and the ‘ribbon’. Instead, I just measured out squares and rectangles and cut them out. 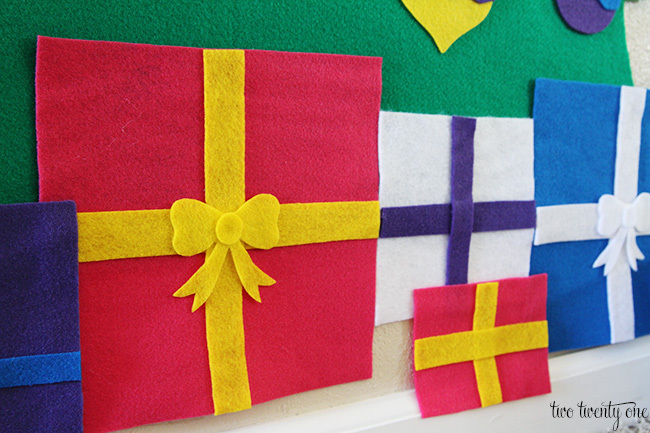 Then I cut strips of felt to make the ‘ribbons’. I used a template for the bows though. 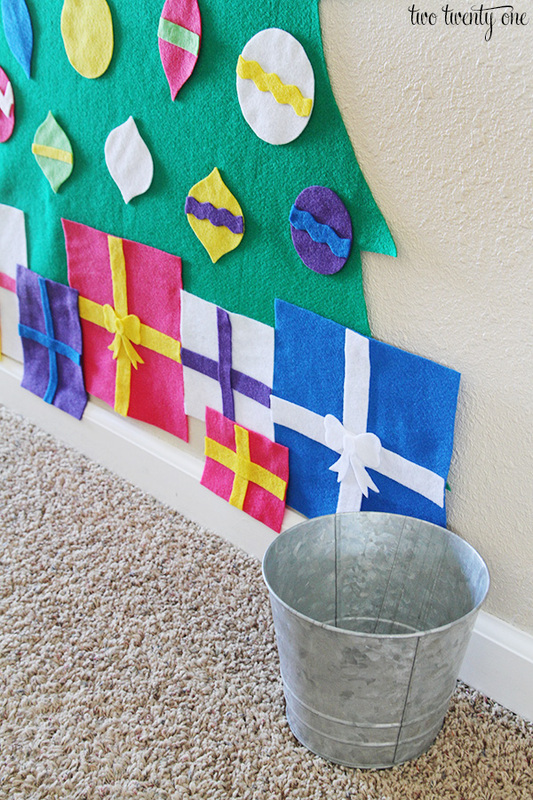 A bucket is place next to the tree so we can store the ornaments and presents when they aren’t in use. Owen was napping when I put up the tree, so when he woke up he was excited to see something new to play with. It seems that he enjoys taking the ornaments and presents off the tree and putting them in the bucket more than putting them on the tree. But I’ll take it. FYI, Owen is 33 inches tall– just to give you an idea of the height of the tree. Here’s the templates. 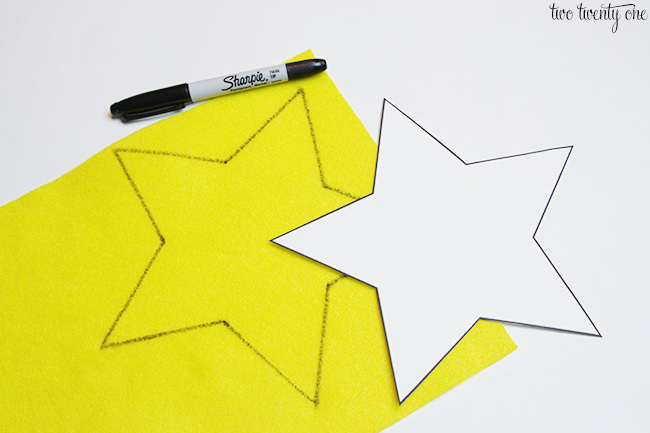 Click on the names of the templates to open a new page and print or save them. 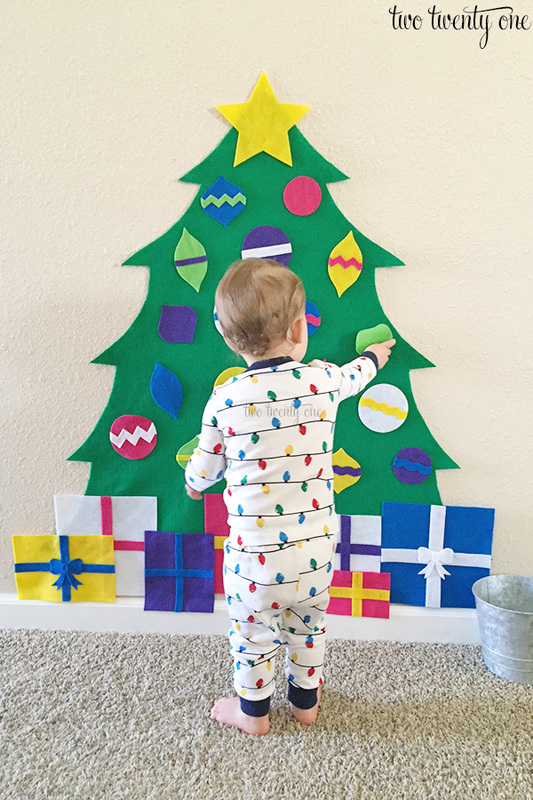 Fingers crossed Owen loves his felt Christmas tree more than our big Christmas tree. 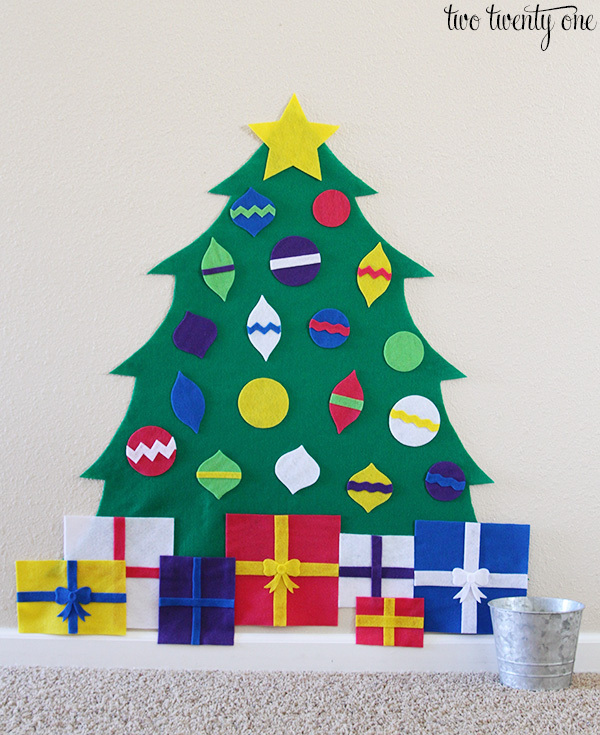 Have you made a felt Christmas tree for your kiddo(s)? Did they love it? Thanks! Hah! I don’t blame you. The other day I was working on something while Brad watched Owen and heard saying something to Owen and the next thing I see is Owen walking by my office with a large piece of green fabric trailing behind him. He had ripped the tree off the wall and was carrying it around the house. Haha! How do the ornaments stick to the tree? Also, where are those adorable pj’s from?!? The bows on the presents are such a pretty detail! They are almost as cute as Owen’s Christmas light pj’s 🙂 great idea!! Always nice to have toys that look good too! I love the size of this! In the first few pictures, I thought it was much smaller. But this is so perfect! This is very clever! I can see children in a nursery or grandkids really enjoying this. Thanks for sharing. How do you attach it to your wall? The patterns printed over sized on three pages I couldn’t use them. I screen shot them and printed them that way though. 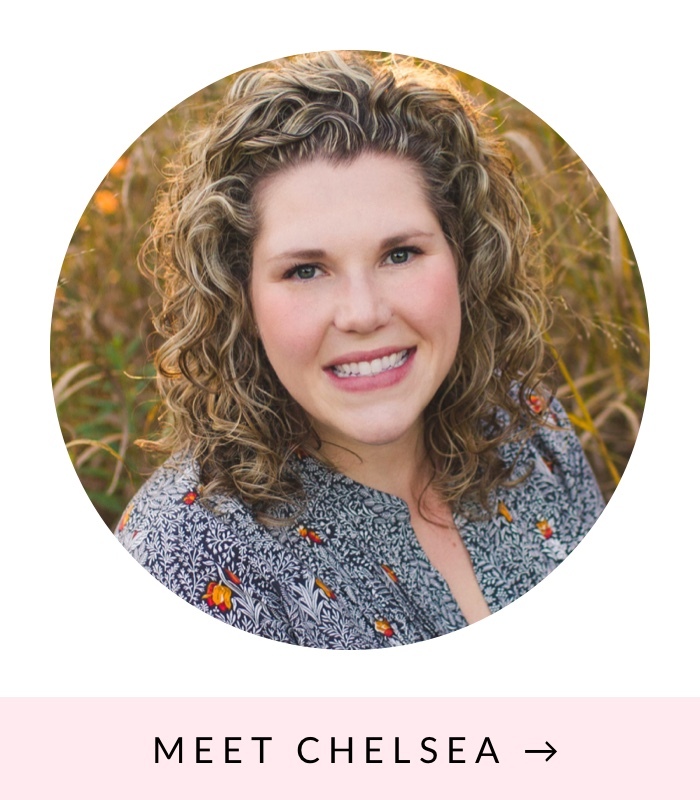 They aren’t set up to be printed from a screen shot, which is why I say to click over and print. If you took a screen shot on your phone then they aren’t going to print correctly. 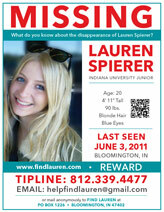 You need to save them and then print if you’re using your phone. 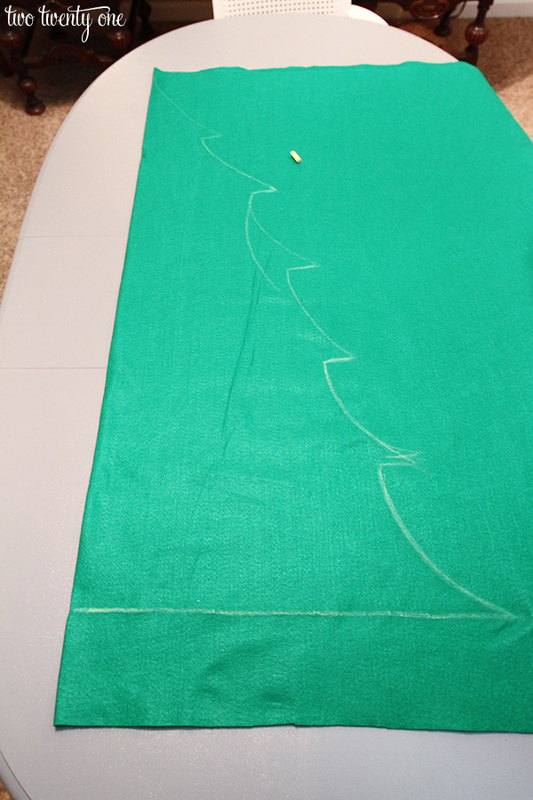 Should the felt be acrylic or polyester (and the same type for the tree and ornaments)? I’m a newbie when it comes to ANY type of craft but would love to do this! WHere did you get your green felt? I’ve never seen any that large! Mind sharing your source? Plan to make this for my daughter this year! Jo-Ann Fabric has the green felt by the bolt. Love this! How much fabric did you buy of the other colors? I bought the sheets so a few of each color. 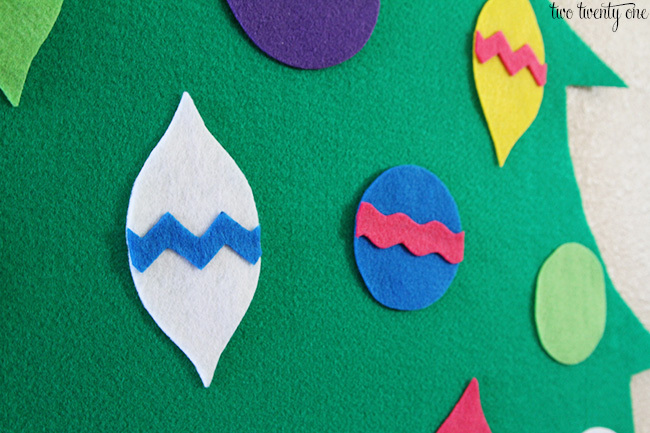 was it the stiffer felt sheets or the thin and flimsy ones for the ornaments? Thanks for sharing! I’m so excited to try this fir my girls this Christmas. i would like to do this for my son but unsure what to use ??? 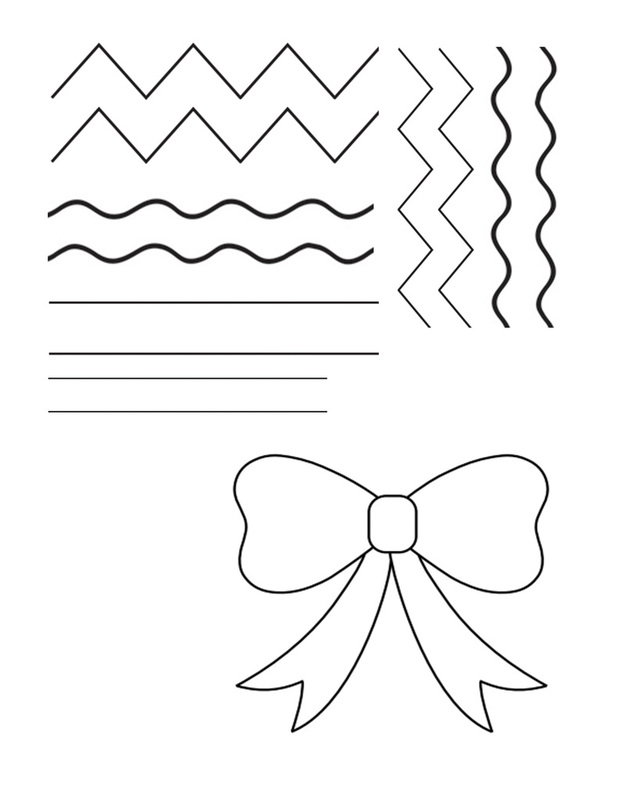 Thank you so much for these templates and patterns! 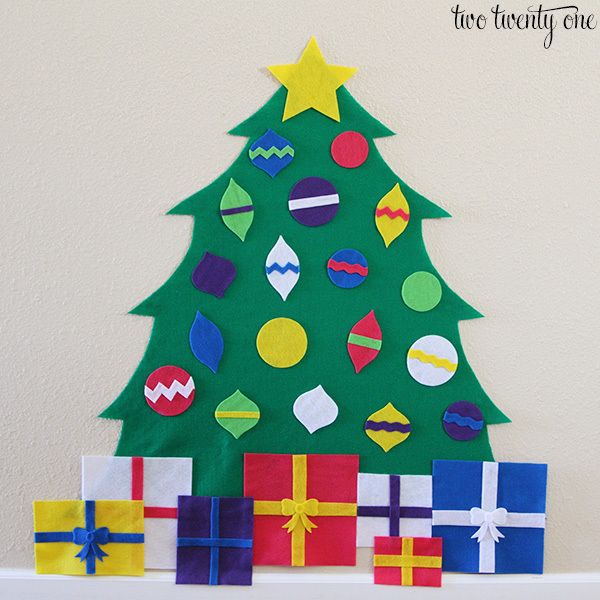 Your tree is too adorable and cannot wait to have mine complete for our little ones! 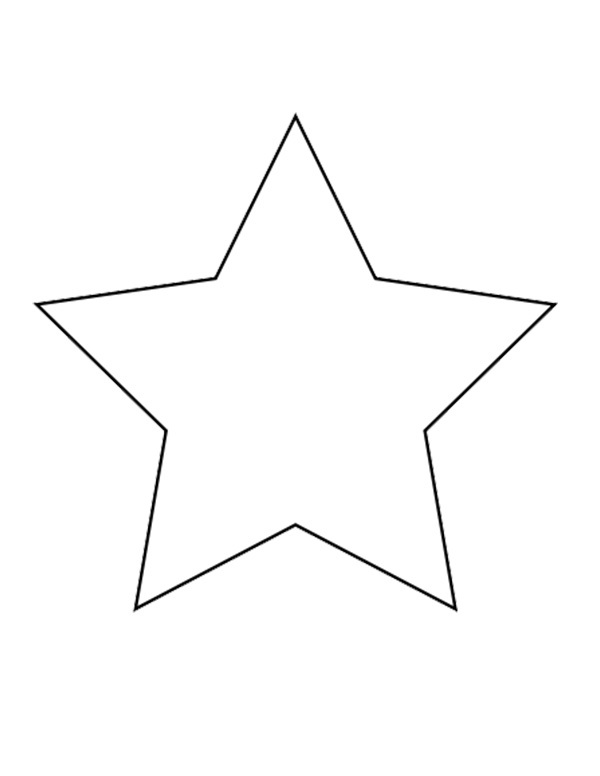 Thank you so much for posting your pattern. I have wanted to make one for the last couple of years and when I found your post it inspired me to make this adorable little tree for my boys. I finished it yesterday and they love it. Another Christmas memory in the books. Merry Christmas!! What do you use to adhere the felt to the wall? I’ve tried 3 different types of tape and it keeps falling off! I don’t want to glue it to the wall! I would try the Command strips that look like velcro. We use those to hang everything in our house. As long as you use and remove them as directed they will not damage the walls. great idea! I have grown tired of fighting with my beloved fur baby cat over the Christmas tree and haven’t put one up for a few years now. but, as I have my grandson this year, aged 6, I wanted to put one up… of some kind. was looking for a poster of one, but the large ones are not sold that I can find. when I heard of this tho, my craft juices got going! What fun Carson and I will have in making this! and best of all the cat won’t be interested in it! I am going to use old Xmas cards, fabric pieces and Xmas gift paper glued to card stock, and whatever else I have on hand, minimizing my cost.I will use glued pieces of velcro to sick the ornaments onto the tree. with velcro, anything can be stuck on. Just found this today through a google search on patterns. Excited to try it with my 18 month old this year!